These days, everyone calls everything “Fake News”. It could be anything from an unbelievable poll on CNN or Buzzfeed reporting on Donald Trump and Hillary Clinton. “Fake News” is defined so many ways by so many people it really has no good definition at this point. Today on the site WRAL.com I noticed a little content box on the side. I lost the screenshot. But the first headline caught my eye. It read “Two Women Blow SharkTank Investors Away With Deal Of Century”. Out of curiosity, I clicked it, and was sent to a site designed to look like People Magazine, although instead of being sent to “people.com” I arrived at “www.people-magazine.online”. Are legit sites profiting from this? WRAL offers great reporting of local news in the Raleigh Durham and central North Carolina area and probably didn’t realize the “promoted content” section of their website was being used to send people to fake People.com websites. News websites all across the United States use content recommendation services to make extra money. In this particular case, an ad box can serve all sorts of advertisements and content and it can change every 5 minutes. It is impossible to police. Viruses are also spread this way as well. Sometimes the actual advertising company isn’t even aware of the problem. This isn’t unique to WRAL – it is hitting almost all news websites across the world. 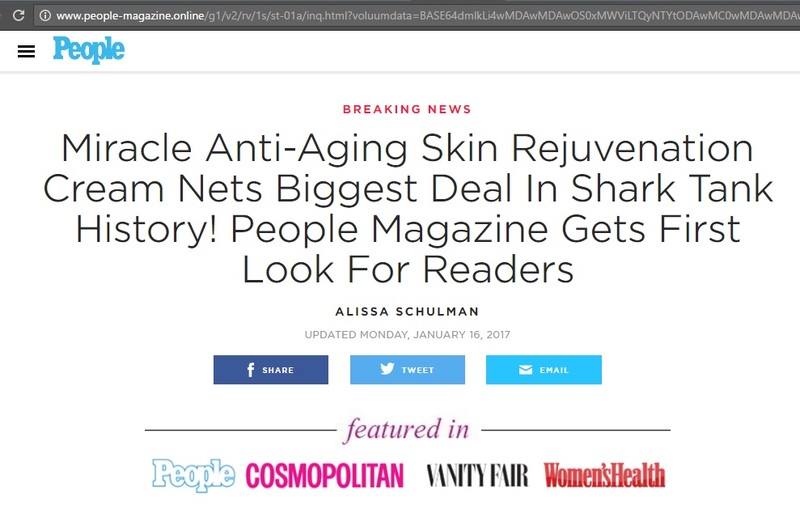 The fake People website is pushing a well known anti aging cream scam. It not only deceptively tricks people into thinking they are reading a well known publication like People, the article tries to send people to “TryResVibrant.com”. What happens here is you see all the fake news about SharkTank and Dr. Oz, go to the ResVibrant site and order a free bottle of cream, hoping to look 20 years younger, but if you do not read the fine print, you end up getting smacked with monthly fees of nearly $90/month. This is not the real People website. Update: It has just been announced that Google has actively been banning publishers from advertising “fake news” and “impersonation” websites. This may be a game of cat and mouse though, as per my example above. I am just amazed again and again about all the fake things on the web,that people make up to scam others into spending their hard earned money. It’s really sad. I am one of those who research everything before I buy something and that is how I came across your post about the fake news and the story about the two Korean sisters taking the Shark Tank by storm, getting them to invest 2.5 mio on a testosterone supplement. Funny thing was, the exact same picture you had for that product, was used on the website “goodfortips15dotcom” which was not a secure site claiming to be Cosmopolitan Magazine and having the exact same article about the shark tank sinking 2.5 mio in a miracle product called “Suisse Renewal”.